Herb Mc Cool of Port Charlotte, Fla. figures he was shot at by North Vietnamese Army regulars and Vietcong guerrillas at least 5,000 times during his three tours in Vietnam. He served in the 67th Maintenance Company from 1967 to ’69 at “Camp Eagle” near the convergence of the Ho Chi Min Trail and the DMZ in South Vietnam. Shortly after graduating from high school in June of 1966, Mc Cool volunteered to be an Army cook. He took basic at Fort Benning, Ga. and from there attended cook’s school at Fort Polk, La. “In 1967 our whole unit got orders to go to Vietnam. I went over with the advanced party, 15 of us from the 67th Maintenance Company. My unit maintained Jeeps, trucks and tanks,” he said. “I flew to Vietnam in a C-130 cargo plane and landed in Saigon. From there we took a Navy vessel up to Da Nang and went by truck on up to ‘Camp Eagle’ near Phu Bai, South Vietnam. “‘Camp Eagle’ was a 101st Airborne post in the middle of the jungle. There were 500 to 800 soldiers at the camp–four companies of airborne and us. Th 101st was an air mobile division. They went to war in helicopters,” Mc Cool said. “Our camp was right along the Ho Chi Min Trail near the Demilitarized Zone. The North Vietnamese Army and the Vietcong used the trail to transport military equipment down south. Mostly the enemy operated at night. “‘Camp Eagle’ was situated in a hilly, jungle area. There were a lot of very tall trees in the area. Only our camp was cleared of jungle, everything else was forest,” he explained. The “Tet Offensive” was the high water mark of Mc Cool’s 18 months deployment to Vietnam. On Jan. 30, 1968 the NVA and VC launched the offensive at night that eventually involved tens of thousands of troops on both sides and engulfed 100 towns and villages that came under enemy attack in South Vietnam for a month or more. What made Tet so damning to the U.S. and its allies, President Lyndon Johnson and this country’s military leaders had just told the American people we had the fight in Vietnam under control and were winning the war. Then came Tet and it became obvious the U.S. involvement in Vietnam was far from over. From the vantage point of the average American it appeared we were losing the war. In reality, Tet was a huge military defeat for North Vietnam and its supporters. In a months’ time it’s estimated 80,000 or more NVA and VC soldiers were killed in the massive enemy offensive. But the U.S. had trouble telling the American people Tet was a big military victory for the U.S. and her allies. As a result, the U.S. and the North Vietnamese agreed in Paris to a negotiated peace in Vietnam. “Tet was an all out offensive to destroy the 101st Airborne’s Huey helicopters,” Mc Cool recalled. “All of a sudden we got hit with mortars, rockets and small arms fire from AK-47 assault rifles. “We were just getting ready to serve the troops when the NVA and VC struck us. The guys were just starting to come into the mess hall tent when the fight broke out. My assistant cook and I decided the fight was on and it was time for us to head out the back with our M-16 rifles, bandolier of clips, flak jackets and steel pot. “We headed for our pre-designated foxholes about two minutes away. Two men were already in the foxhole manning the M-60 machine-gun when four more of us arrived. “Depending on how the fighting went a Jeep would come around about 4:30 or 5 a.m. and pick up the four cooks in our outfit. Two of us would go right into the mess hall and get everything ready for breakfast. Despite the massive Tet offensive that went on for weeks, the enemy rarely broke through the razor wire encircling “Camp Eagle.” When it happened NVA or VC soldiers were quickly cut down by American soldiers defending the camp. The 101st Airborne lost a few of their helicopters in the fight. They were quickly replaced and the war went on. “A short while later my time in Vietnam was up. I flew home on a civilian plane and landed in Alaska and then went on to Seattle, Wash. We got off the plane in Seattle in our class-A uniforms,” Mc Cool said. “Thirty or forty people were waiting at the airport protesting our arrival. These people swore at us and called us ‘Baby Killers!’ They called us all kinds of other names, too, and gave us the finger,” he said. “It was even worse when I reached home in Springfield, Ohio. “On the flight from Seattle to Chicago we were wearing civilian clothes, but our military haircuts gave us away. A couple sitting near me on the plane asked where I was coming from. When I told them Vietnam they got up and moved to the front of the plane away from me. “When we arrived in Chicago we had to put up with another bunch of Vietnam protesters. We were called names all over again. Shortly after getting out of the Army the first time, Mc Cool went to work as a finger print analyzer at the FBI’s main office in Washington, D.C. He worked there several years and then got a job as a cook in an orphanage for several more years. In 1976 Mc Cool re-upped and went back in the Army. About the same time he got married and the newlyweds spent the next three years in the service in Germany having a great time exploring Europe by car when he wasn’t working for Uncle Sam. By 1986 he had spent time in Germany, Panama, Fort Benning and Fort Bliss, Texas. It was at this stage in his life Mc Cool began to feel the effects of Agent Orange, a defoliate spray used in Vietnam that soaked thousands of U.S. troops in the bush. After some months in a VA hospital undergoing all kinds of tests Mc Cool’s wife divorced him and he retired to Port Charlotte not in the best of health. Looking back on his service career, Mc Cool says Vietnam was a different kind of war, not like World War II. “In World War II a solder knew who the enemy was. They wore different uniforms and you knew where the front lines were. In Vietnam you didn’t know the enemy until they started shooting at you because they wore no uniform and there were no front lines,” he said. “In Vietnam I fought for my country. But when I came home I was treated like dirt by people in America,” the ailing old soldier said. He has three grown daughters: Amy Melissa and Martha. This story was first published in the Charlotte Sun newspaper, Port Charlotte, Fla. on Wednesday, Aug. 28, 2013 and is republished with permission. I was in the 67th Maintenance Company in Vietnam 1968.You could not have landed and went by boat to Camp Eagle like you state, because it wasn’t made until after TET. The whole company flew into Saigon and was stationed at Phi Loi at first. I don’t recall a Sgt McCool at all in our company. If your going to tell a story, you should get the facts right. I was in the 67th at Camp Eagle April 68 it was a new base do remember the place was big grave yard and tents .As Dan said we flew into to Saigon then on to Phu Loi ,the only ship was when we moved up north stayed at China Beach then on to Phu Bai then on to Camp Eagle by truck A lot facts in your story have some huge holes in it . I was in 67th at Camp Eagle also. Maintained the computers (NCR 500s) in the two trailers w/ the 2 generators. Also worked on the same systems across the road at the 801st Airborne sometimes. 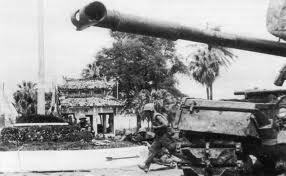 Didn’t arrive at 67th till Mar 68, a little after Tet (was in Saigon on Tu Do – or was it Vo Taun) St outside main gate when NVA rolled in tanks from the race track). Xferred to Phu Bai / 67th just after TET. I don’t remember McCool but at this age doesn’t mean he wasn’t there. I do remember all the graves around our camp. And we used to set up the movie screen so we were facing the mountains. Then when we were watching movies, we could see the trail of the 122s off the mountain. And depending on trajectory we’d stay seated/standing watching THE MOVIE or if close enough we’d wait till the last couple seconds, then jump into one of the convenient walled graves at the top of the hill where we showed movies – had a few drop pretty close but nobody was hit while I was there for a year. Got a hundred other stories like all who were there do, every day was different – took a jeep to Phu Bai airport and up Magic Mountain one day – a blast – Sarge and Lt weren’t happy when I got back . . . another time took a jeep and went to north of Hue where Marines were on DMZ to see a friend – another fun time . . . Figured out I’d have a heck of a lot hassle if I took 801st jeeps instead of 67th – had about 50 road trips – lucky I made it out – . . . Thank you for sharing part of your experience. When Don interviews a veteran, he asks for – and always gets a copy of that vet’s DD-214. We’ve been taken in a few times. Even once is one time too many. We’re glad you made it back. Hello, Tom, Your story aligns with my experience. Phu Loi beginning in January,1968 to Campa Eagle via a Korean operated LST to China Beach to Phu Bai/Camp Eagle. Do you remember the CO and 1st Sargeant? What was you MOS? Mine was 41c20, but I was the comoany mail clerk for about 4 months until my DEROS January 9, 1969. HOW COULD MC COOL HAVE THE ARMY ACHIEVEMENT MEDAL (FIRST ISSUED IN 1980) AND THE PROFESSIONAL DEVELOPMENT RIBBION (ISSUED IN 1981) WHEN HE WAS DISCHARGED ON AUGUST 28 1979. MR MC COOL PLEASE EXPLAIN!!!!! I first joined the 67th Maint. Co., stationed in Ft. Campbell, Ky. in Feb. 67, right after AIT in Fort Dix, NJ. I was in supply and prior to deploying to Nam in Jan. 68 knew just about all of the NCO’s and Officers and can honestly say I don’t remember a Sgt. McCool. I believe we flew in Long Binh and remember DaNang and our first base at Phu Loi, then Phu Bai. We did take a naval cargo ship but I can’t remember the exact destination points. All I remember was being cramped up below deck which was the pits. If Mr. McCool would be so kind to name some of the NCO’s and officers it would clear up a lot of questions concerning his post. I’m going to take another look at his DD-214. We’ve had a few questions about this interview. If this post disappears in the next week or so, you’ll know why. We strive for accuracy and honesty. We don’t want to deal with BS on any level. Anyone know when Camp Eagle was shut down?